A quiet apartment for 4 people situated in the centre of Kraków in new building with a reception and security. This cosy and modern apartement consists of a bedroom with a double bed, a lounge with a double convertible sofa, a fully equipped kitchenette and a bathroom with a bath tube. 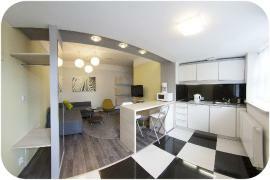 For your convienience the apartment has an intercom, free WiFi Internet access and TV SAT Premium Cyfra +. The building is guarded 24/7. There is a reception around the corner open from 8am to 11pm. It is possible to park your car in the underground garage. The fee is 35 PLN/day. Reservation is required. The building is guarded 24/7. Nearby guarded parking is 50 PLN/day. It is also possible to park in the street 3 PLN / hour and free between 8.00pm and 10.00am and weekends.